Lignin syringyl/guaiacyl (S/G) ratio is a key trait in the cellulose pulping industry. Near-infrared (NIR) spectroscopy data collected with a bench and a portable instrument were used to develop prediction models for S/G ratio from sawdust samples of 1220 trees of two contrasting Eucalyptus species, namely E. benthamii (n = 484), which is a temperate, cold-resistant species, and E. pellita (n = 736), which is a heat- and disease-resistant tropical species. For each species, samples were selected based on maximal NIR spectral variation and analyzed for S/G using a streamlined thioacidolysis method with minimal sample input. NIR models were developed for each species separately and jointly. 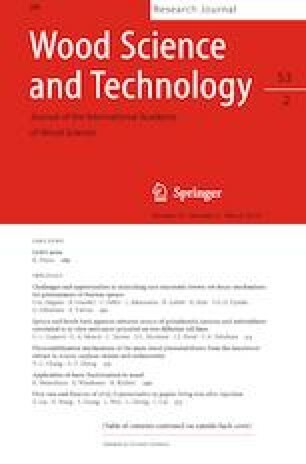 Instead of just using the coefficient of determination (R2) and the ratio of performance to deviation (RPD), the Spearman’s rank correlation (rs) and the average of the coefficient of correlation between the references and predicted values (CVRP) were taken into account to evaluate the models. The bench spectrometer had a better performance than the portable instrument (R2 from 0.77 to 0.86 versus 0.31 to 0.47). Species-specific NIR models were better for E. benthamii (rs = 0.89, CVRP = 2.75%, R2 = 0.86 and RPD = 1.8), while the joint-species model was better for E. pellita (rs = 0.97, CVRP = 3.98%, R2 = 0.82 and RPD = 2.1). These NIR models should prove useful for high-throughput wood phenotyping in advanced breeding programs. We thank the Laboratory of Forest Products (Brazilian Forest Service) for the availability of the MicroNIR 1700 acquired through Conselho Nacional de Desenvolvimento Científico e Tecnológico (CNPq, Project no. 473936/2013-5) and the Coordenação de Aperfeiçoamento de Pessoal de Nível Superior for the master’s degree scholarship for CPD. We also acknowledge Embrapa Forestry Center for providing the raw wood samples. This work was also supported by PRONEX-FAPDF Grant 2009/00106-8 ‘NEXTREE,’ CNPq Grant 400663/2012-0 and Embrapa Grant 03.11.01.007.00.00 to DG. DG received a research fellowship from CNPq.